Carving pumpkins is a seasonal favorite activity, but sometimes this project could use a little twist. Making pumpkin art for decorations and have too many to carve? Have little kids that you don’t want around sharp carving tools and candles? 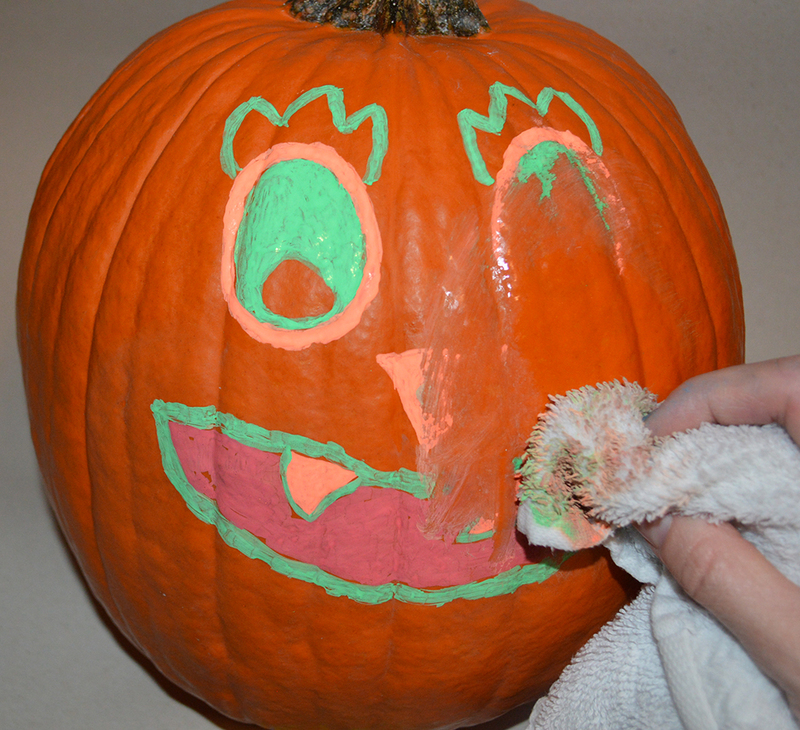 Or if you are just looking for something different this year… try pumpkin painting! Be as simple or as detailed as you want to be! The possibilities are pretty much endless- see what awesome faces & designs you can make! 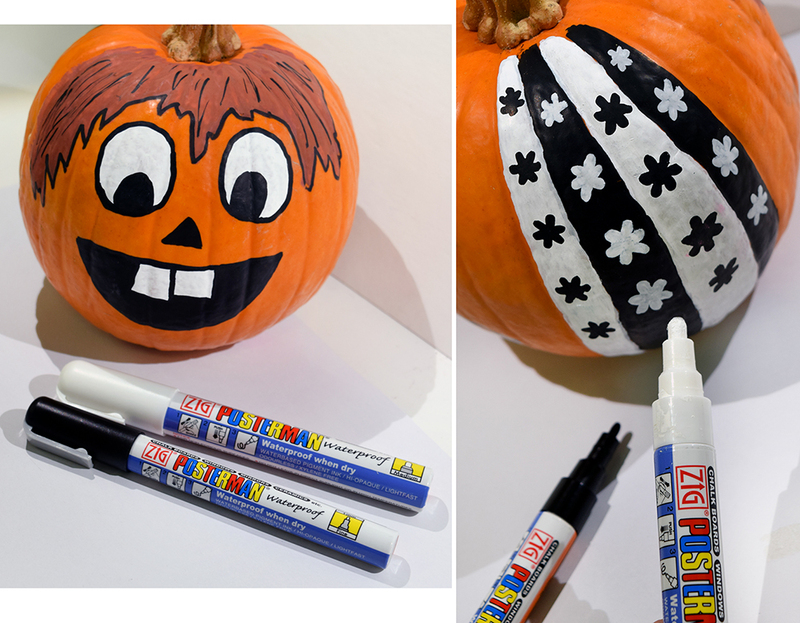 Note: If you are looking to do this craft with kids, make sure to use WATER-BASED markers (such as ZIG Posterman, ZIG Woodcraft, and Sharpie Poster Markers). They are safe to use and clean up more easily. 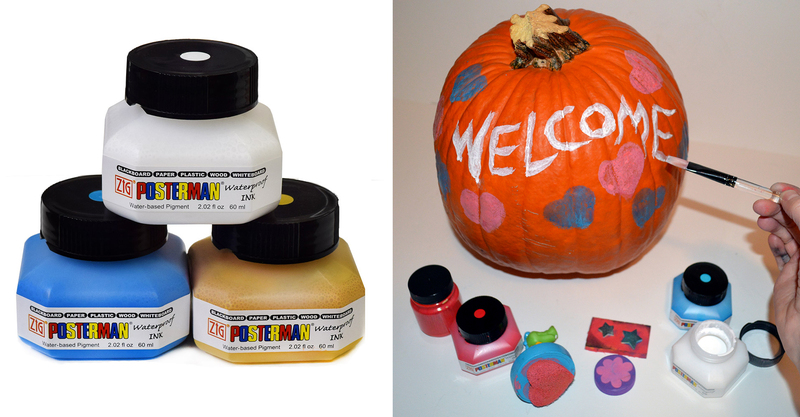 When doing faces and designs, the Zig Posterman Markers worked the best with our pumpkins. They applied evenly, didn’t drip down, and dried quickly and smoothly. The Posterman Medium PMA30 and Fine PMA20 sized bullet tips work great for drawing and writing! Posterman Ink should hold up well under rainy conditions! 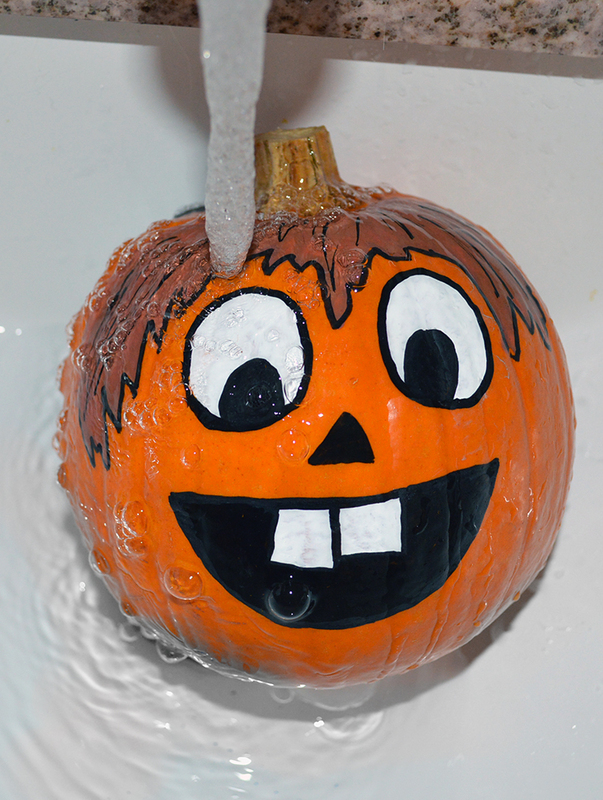 ..Or if you want to give your pumpkin a bath.. Reminder to test your markers before you get started! The Posca paint markers applied well at first, but within a few minutes, began to crack and flake off!! So always test a small area with your markers first, before you get too far into your artwork, to see how they react with the surface being painted on. Good thing we’d only done one part! 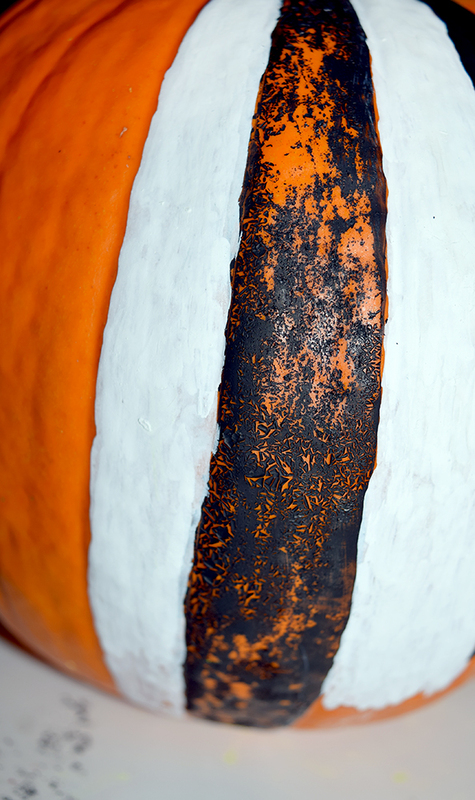 This pumpkin was not a fan of the Posca paint. A great way to test out our new Posterman Waterproof Ink! The same great ink from Zig markers- in small plastic jars! 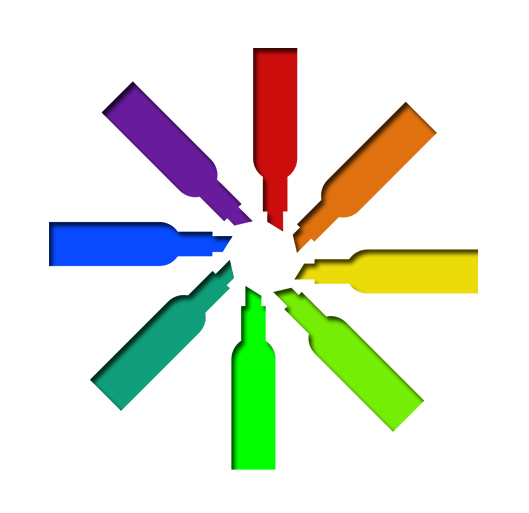 Make custom colors, and apply with any tool you wish- paint brushes, sponges, stencils- whatever!! 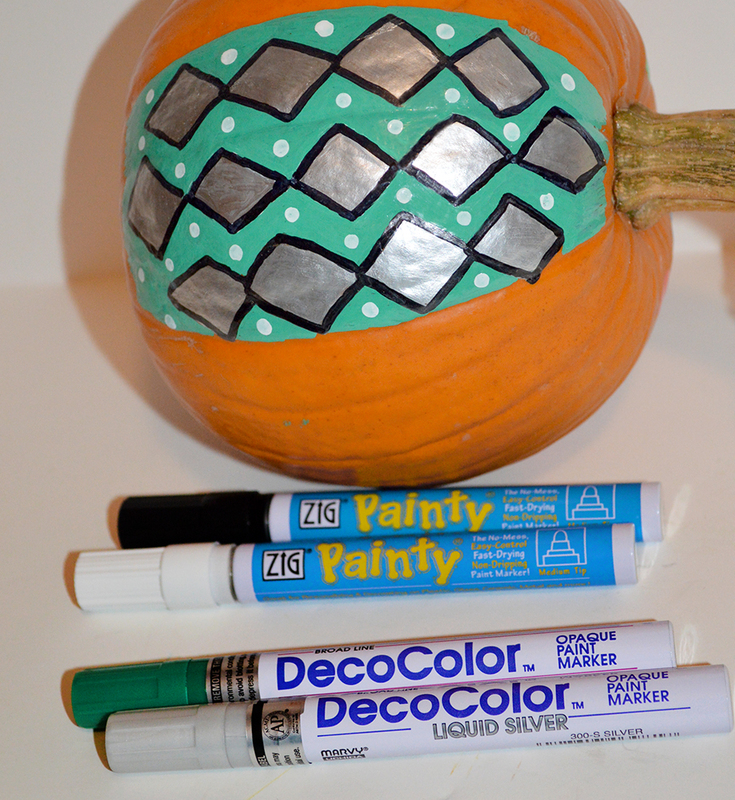 The Zig Illumigraph Markers were fun to use on pumpkins too! The Biggie 50 tips made “splatter art” super easy. 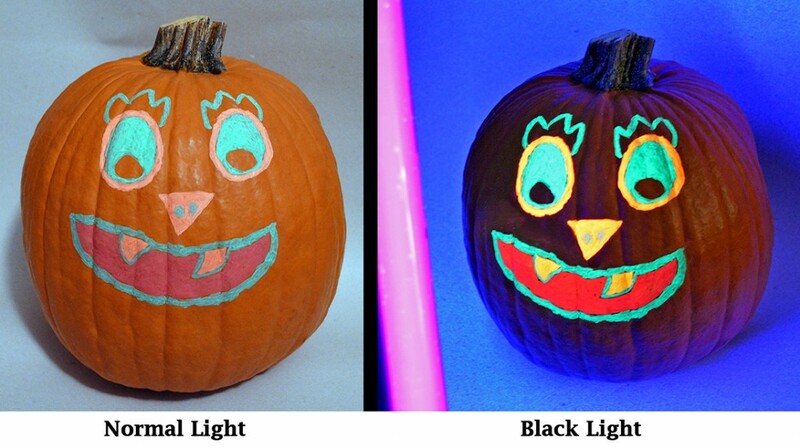 Plus, the Illumigraph Markers glow under UV light- so if you have a black light to put near your pumpkins- these markers will really make them stand out at night!! 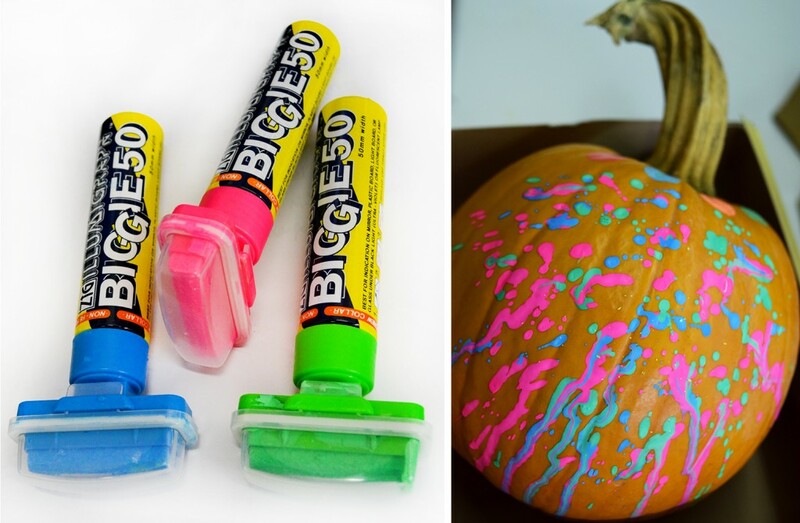 Note: Illumigraph paint markers are a “wet-wipe” marker, so keep those pumpkins inside- your designs will not be waterproof! But this feature does make it simple to fix and re-do any mistakes! Illumigraph marks are easily removed with a damp cloth! The Marvy Decocolor & Zig Painty markers applied pretty well- needing a second coat in some places to get even color. They left a beautiful glossy shine even after the paint was dry! Plus, these markers are super-permanent, so your designs will stay put in the rain or snow! And with each marker having a large palette of unique colors, it will be easy to find some you love! Note: These markers are oil-based and contain Xylene- making them NOT good for kids to use!! If the fall season gives us an abundance of any potential art material, it would be leaves!! 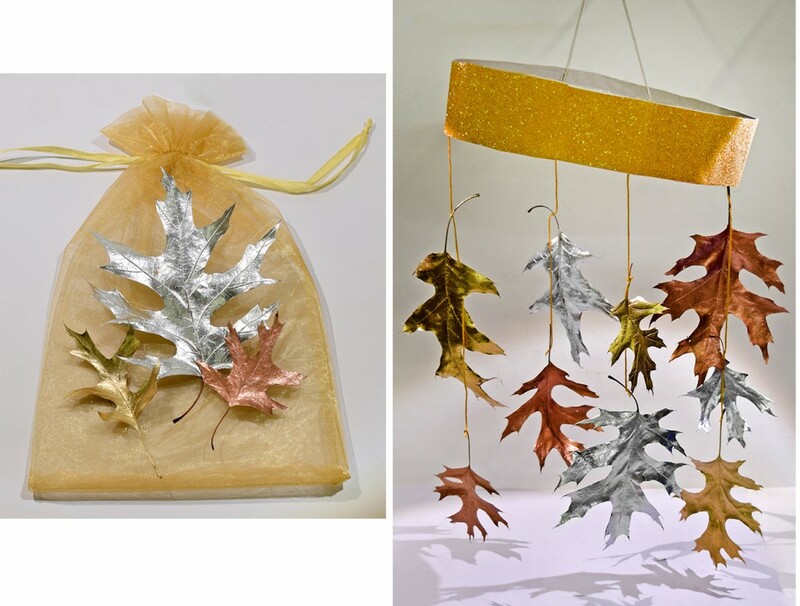 One of our favorite projects this year was using the Krylon Leafing Pens to make some beautiful metallic leaves. A pen with “LEAF” right in the name seemed to fit! And the results were awesome! Krylon Leafing Pens smoothly apply special paint that looks like real metal! 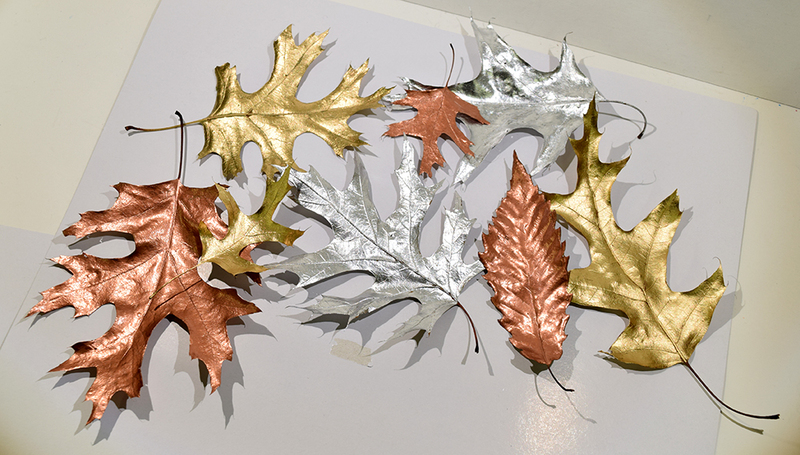 Use your metallic leaves loose as table or shelf décor, glue (or decoupage!) them to cards or other objects as a unique embellishment, or make decorative mobiles / wind chimes! The Zig Fudebiyori and Sakura Gelly Roll pens can help add some nice additional metallic/glitter designs! Try the Krylon Leafing Pens for yourself! These special paint markers come in multiple colors and create a look of real metal accents- adding a fancy touch to a wide variety of objects! Also good for these types of projects are the new Marvy Decocolor Premium Metallic Markers! *Note: Due to the content of the ink in these markers, they are NOT suitable for kids to use. Dressing up for Halloween this year? Marker Supply has a wide variety of fabric markers that can help you create or touch up whatever your costume may be! –Marvy Fabric Markers come in 3 different tip sizes and are pigmented ink that you don’t need to iron to heat set! Just apply and let dry, then it’s permanent and waterproof! –Marvy Decofabric Markers have various special effect markers including glitter and fluorescent! Also find them in handy sets- including a Halloween set and an Autumn-color metallic set! 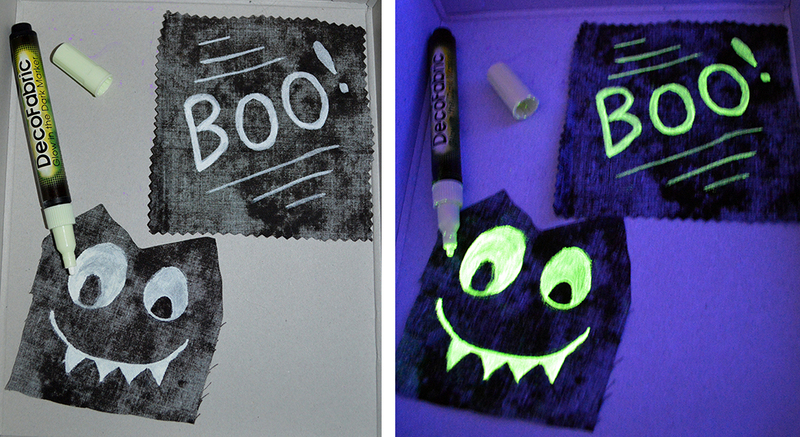 Try the Glow-in-the-Dark Decofabric to add a fun glowing effect! As always, we’d love to see what arts & crafts you guys are doing! 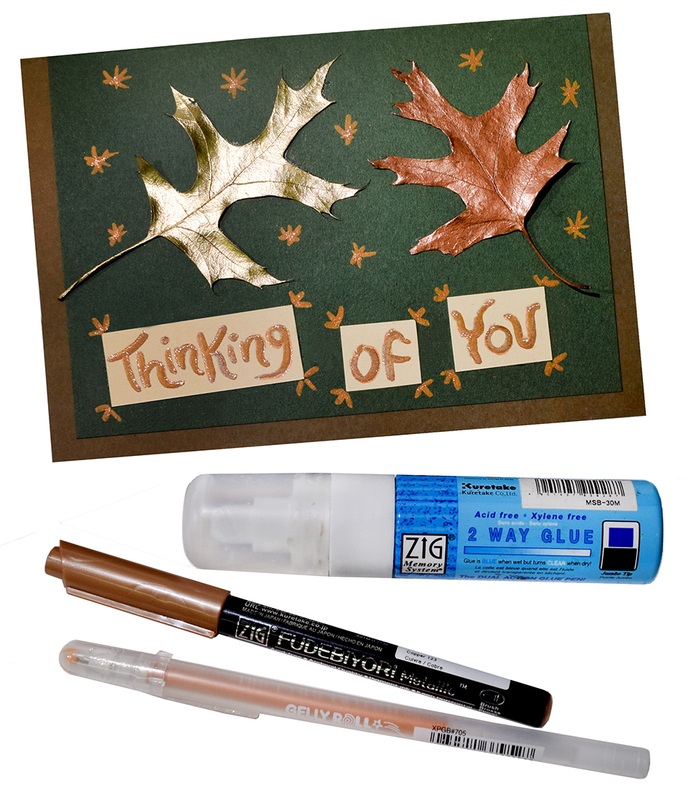 Share your autumn marker projects with us on Facebook (Marker Supply), Instagram (#MarkerSupply), Twitter (@MarkerSupply), or by EMAIL!